A Jesse Tree is a fun way to teach children about the events leading up to the amazing birth of Christ. It can become a visual reminder of how incredible God is, of what He has done and how He has worked it all together to bring about Christ’s birth and mans redemption. God promised that the Savior, our Lord Jesus, would come through the line of Jesse and God always keeps His promises. A Jesse Tree is simply a walk down memory lane so to speak; a journey through the old testament that climaxes with His birth. The ornaments: A picture or symbol for each days reading that relates to the daily bible reading or story. Some families make their own ornaments, others buy them. If you search online, there are many printable versions of the ornaments. We just printed ours out, glued them on cardstock and laminated them. The tree: A place to put your ornaments Some families use a felt wall hanging tree with felt ornaments, or you can use a branch in a pot or an actual mini Christmas tree to display your ornaments…there are so many unique ideas. We have a little tree, I purchased it back in December 2009 when we began our Jesse tree journey. Each December 1st out it comes and is given a place of importance on our sideboard. A little wooden chest holds the ornaments, laminated on cardstock, each a symbol of the bible story read each day; a journey from the creation of the world, to the birth of our Savior. 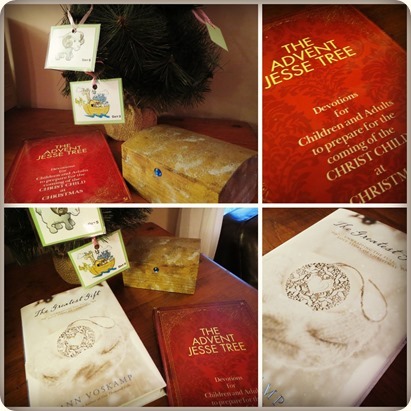 We use The Advent Jesse Tree book as a family. I’ve been pleased with it; a symbol, a scripture verse (KJV), a suggestion of songs to sing, a short story and then questions for the children. I’ve never timed us but it I would guess 5-7 minutes. We take turns finding our ornament in the chest and hanging it on the tree. At 5 and 6, I feel that my oldest two are really ‘getting’ it this year – previous years I wasn’t quite so sure. This year, mama is also reading The Greatest Gift: Unwrapping The Full Love Story of Christmas and I am loving it. So far, my readings correspond with the family readings which just really enhances it for me. It’s given me insight to things I hadn’t seen before, has given me much to think about and is causing me to fall more in love with my Savior as I anticipate His coming. The authority of God made creation – “let there be”, yet the affection of God made man – “let us”. Incredible! The first question found in the old testament: God asks ‘where are you?’ since we became lost because of that pivotal moment in the garden so man years ago. The first question found in the New Testament: the wise man asked, ‘where is He’? because we can only find ourselves when we find Him. Amen! Our Jesse Tree is an important part of our family Advent worship but reading The Greatest Gift, I think, is a new tradition that will be an important part of my personal worship as I anticipate Christmas. What a blessing to my heart! He already came. Jesus was born, lived, died, rose again, and ascended to heaven. Through His death and resurrection, I have life. I love the Advent season; a chance to slow down, to anticipate and celebrate His coming. Isn’t that an incredible gift? That every year, year after year, we have a special advent season to savor our Saviour, to really take time to marvel at the marvelous-ness of Him. And I just had this thought - no man knows the hour (Matt 24:36) but wouldn’t it be neat to have the Lord Jesus come for His own on Christmas? Do you have any special traditions that help you keep Him in focus? This post is under “Faith, Teaching Tots” and has no comments so far.